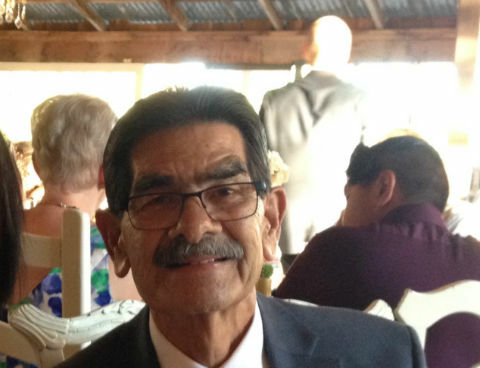 Henry Eugene Santillanes, 79, peacefully passed away on Wednesday, October 21, 2015 at Serenity House in Santa Barbara with Irene, his wife of 35 years , and good friend, Margo Zapata, at his side. Henry leaves his three children, each of which he loved unconditionally and was so proud of, Dr. Mario E. Santillanes of Huntington Beach, Maria Alvarado (Robert) of La Verne and Stephen E. Santillanes (Ashley) of Lompoc. He has nine beautiful grandchildren, each one being very special to him, Holly, Courtney, Reyna, Leah, Isabella, Ephren, Damon, Anthony and Bella. He also leaves his brother, Richard Santillanes (Mary) of Carpinteria and Lydia Lopez of Washington as well as several close family members whom he loved much. Henry also has many wonderful friends who he would pray with and share of God’s redemptive love. He especially enjoyed his time with his closest “brothers” Michael Solodon and Alfred “Sonny” Zapata. He leaves behind a great legacy of service and love for his Savior and Lord, Jesus. A Celebration of Life Service will be held on Saturday, November 21st at 11:00am at South Coast Church in Goleta, with a reception following. Donations in Henry’s memory can be made to Serenity House in thanks for the lovely nurses, aides and volunteers in their special care of Henry and the family.